A great holiday tradition for many generations of Chicagoans is to go see the holiday display at Marshall Field's. 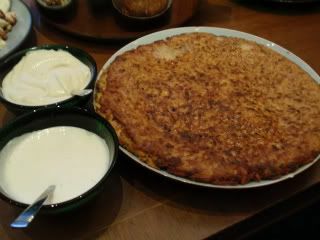 One of the most famous Field's food items (besides Frango Mints) is Mrs. Herring's Chicken Pot Pie, served in the Walnut Room on the 7th floor. It's still being served there, even though Field's is now Macy's. 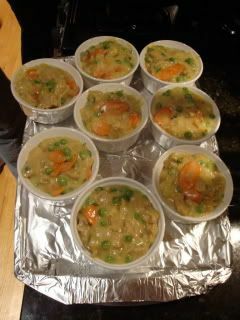 . . but as a tribute to the Chicago Holiday tradition, we made a vegan version of the Marshall Field's Chicken Pot Pie. For the recipe, we substituted chicken-style seitan for the chicken, Smart Balance w/flax for the butter, soy milk for the milk, and a concoction of oil, salt, and sugar for the egg wash. I've noted what we did in italics below. It turned out AMAZING, just as good as I remember it. 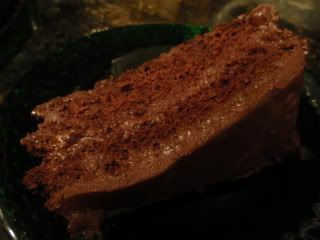 The only thing we thought needed tweaking was the egg wash, to make the crust shinier. But the taste was dead on! 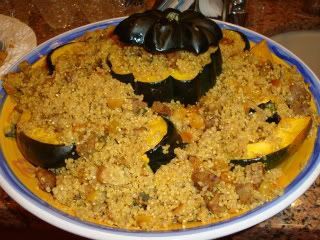 We're definitely going to be featuring it as the main course at our holiday dinner party next weekend. Cook the seitan chicken and make the chicken stock. 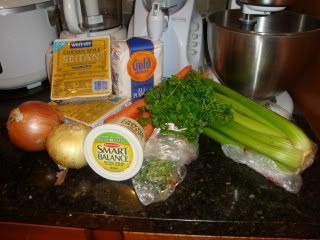 Combine the seitan chicken, carrot, celery, onion and salt into a large stock pot. Add cold water until just covered and bring to a boil over high heat. Reduce the heat to a simmer and cook for 45 minutes. Remove the seitan chicken from the pot and let cool for 15 minutes. 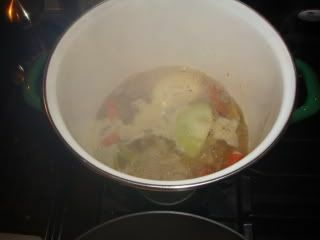 While the seitan chicken is cooling, continue to boil the remaining water and vegetables in the pot. When the chicken has cooled enough to touch, strip away as much of the meat as you can. Place the meat on a dish, set aside. 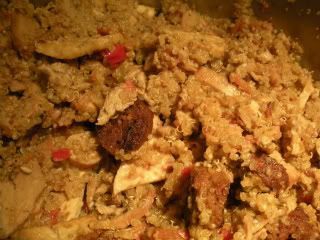 Return the chicken bones to the stockpot and [Since we were working with seitan, we didn't have bones to work with.] continue to boil, on high heat, until the stock has reduced to a quart or quart and a half. Set aside 2 1/2 cups of the stock for this recipe. The remaining stock you can refrigerate and store for another purpose. Prepare the pie crust dough. Combine the flour and salt in a food processor. Add the chilled butter cubes and pulse 5 times to combine. And the shortening and pulse a few more times, until the dough resembles a coarse cornmeal, with some pea-sized pieces of butter. Slowly stream in ice water, a tablespoon at a time, pulsing after each addition, until the dough sticks together when you press some between your fingers. Empty the food processor, placing the dough on a clean surface. Use your hands to mold into a ball, then flatten the ball into a disk. Sprinkle with a little flour, wrap with plastic wrap, and refrigerate for at least 30 minutes, or up to 2 days, before rolling. Preheat oven to 400°F. In a large skillet, melt butter on medium heat. 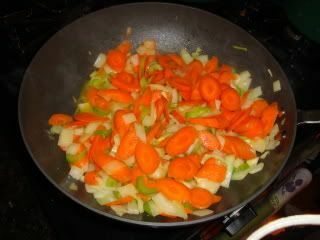 Add the onions, carrots, and celery, and cook until the onions are translucent, about 10 minutes. Add the flour and cook, stirring, one minute more. Whisk in 2 1/2 cups of the chicken stock. Whisk in the milk. Decrease the heat to low and simmer for 10 minutes, stirring often. Add the chicken meat, thyme, sherry, peas, parsley, salt and pepper and stir well. Taste and adjust seasoning if necessary. Divide the warm filling among six 10-ounce ramekins. 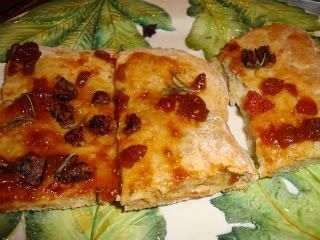 Roll out dough on a lightly floured surface to a little less than a quarter-inch thick. Cut into 6 rounds, slightly larger than the circumference of the ramekins. Lay a dough round on each pot pie filling. Fold the excess dough under itself and use the tines of a fork to press the dough against the edge of the ramekins. Cut a 1-inch vent into each individual pie. Use a pastry brush to apply an egg wash to each pie. 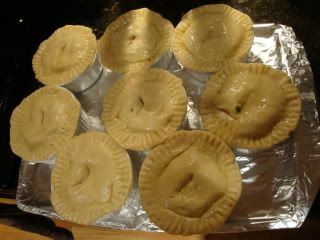 Line a baking sheet with foil, place the pies on the baking sheet. 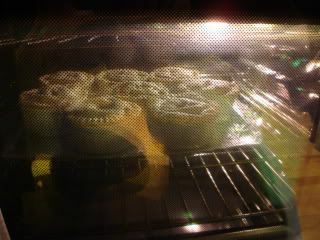 Bake at 400°F for 25 minutes, or until the pastry is golden and the filling is bubbling. Let cool for at least 5 minutes before serving. Your guests are quite lucky. 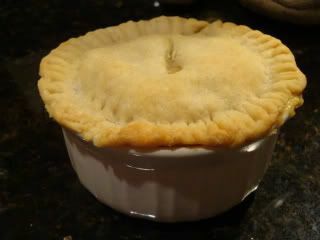 I've been craving a veggie pot pie for months now! I can't wait to hear what they say about it. They loved it! You should definitely try it out. For the party, we were able to make the crust the night before. . . so assembling and baking the pies the day of didn't even take that long. And since we're veggie, skipping the part where you make the chicken stock also speeds up the process! Follow me on my food adventures! 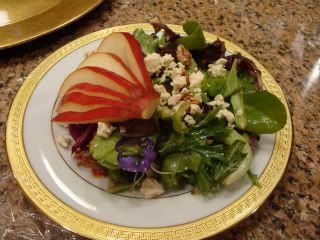 My goal is to seek out new ways to experience delicious & healthy plant-based food while living it up in the big city. This involves trying out new cuisines, hot spots, restaurants, venues, and lots of experimentation in the kitchen! Like what you see? Become a Follower! A Mugful of Holiday Cheer!